I love the colors, look like the pictures. 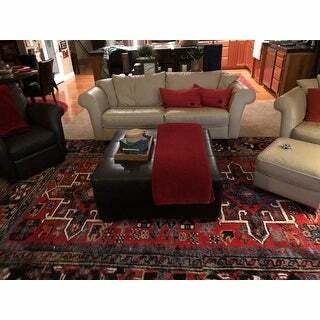 The rug is soft, looks well made and I like the tribal vibe. Adds a good punch of color to our black and white house and the price is very fair! The rug shipped fast. 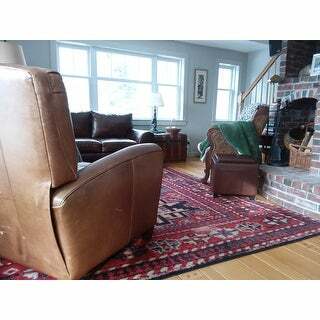 It is extremely soft and looks great in our livingroom. 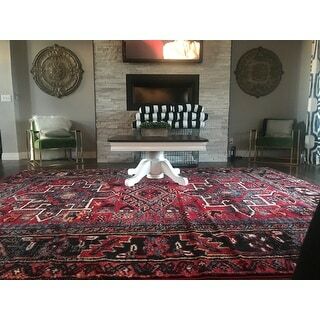 I will definitely buy another rug from Overstock again. What I disliked is that it took a few days for the wrinkles to flatten out. 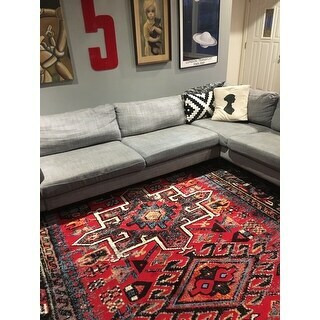 I've watched this rug off and on for several months before I finally decided to buy it. 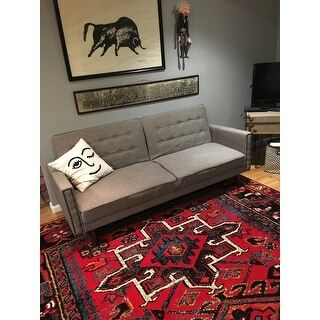 I have a mid-century eclectic thing going on in my living room, and I wanted a vintage rug without the vintage price. This rug seemed like a perfect solution. It's a generous size, and very soft underfoot. The colors are so bold. Maybe if they have been slightly muted a little, the vintage affect would've worked. As it goes, the rug looks a little bit like it's trying to hard. I'm a little scared to find out how much it would cost to ship it back, but I may have to. BEAUTIFUL rug! Exactly what I was looking for, the colors are dark and bright. It really brings my while living room together. Very happy with this purchase! We love this rug! We just received it yesterday and are happier than expected. It’s very soft underfoot. I will say it’s bright and bold so caution if that’s not your thing. Definitely does not have that soft vintage look to it. It definitely looks like a new remake of a vintage rug because it’s sort of pixelated. Hard to describe this but it’s clear it was made on a computer not handwoven. But the price point is so great that it’s hard to be annoyed by that. BEAUTIFUL RUG. Bought the 9x12 and it is of amazing quality, stunning color and it is soft. I wasn't sure by the picture exactly what I was getting but we finally put it down in our new home and were very pleased!! The colors are perfect and we liked the vintage look of the uneven pattern. 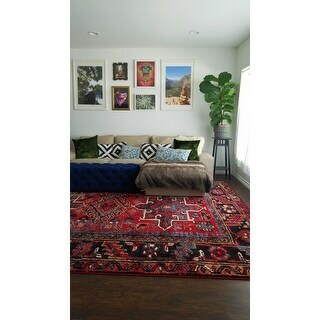 The Safavieh Vintage Hamadan area rug is even more stunning in person! It is definitely a bold choice and one that should be made to get away from boring and common earthy colors. We are absolutely ecstatic to get our hands on this beautiful rug, can't wait to entertain with this eye catching piece! This rug is fantastic!! When it arrived I was pleasantly surprised since some reviews said color was not same as pictured. Well I found it to be exactly if not better than it was on line. In fact I am ordering the 10x14 for my living room and giving the 9x12 to my daughter for her home since she loved it so much she asked me to get her one too. 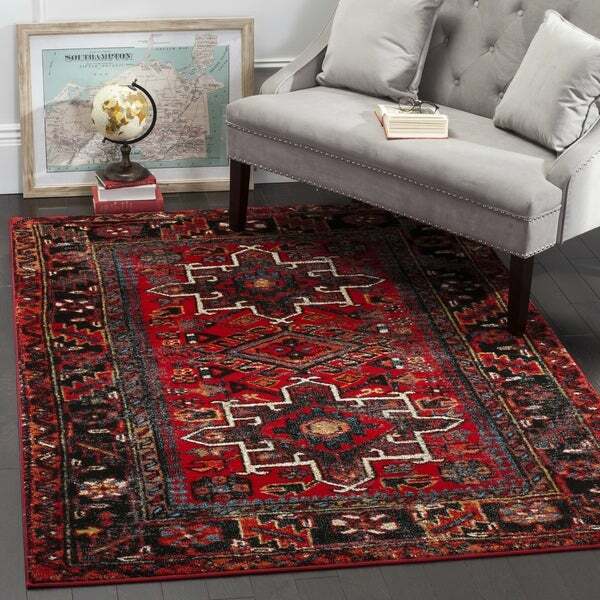 If you're on the fence about this rug go ahead and order it, you'll be very happy you did! For the price, this rug is decent. When you look at it closely, you can tell it's not an expensive imported rug, of course. 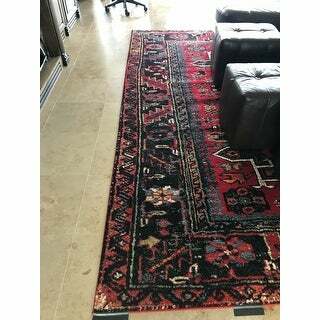 But that's not what this rug is good for...If you ar looking for that, invest elsewhere. This rug is good to achieve that "look", without such a financial commitment. Say, if you have kids, or dogs, and want a grown up look but know you are going to be getting the real thing down the road when your life isnt about pet hair, toys and high traffic. For lounging on, under foot and general decent style, it works, especially on sale. I can't say how long it will hold up, but it should go as long as you want it to. Not an heirloom piece, but good for the the next few years for sure. I bought 2 in slightly different styles for one large room, 2 living areas. This rug is awesome--thick and bright and just what we wanted. 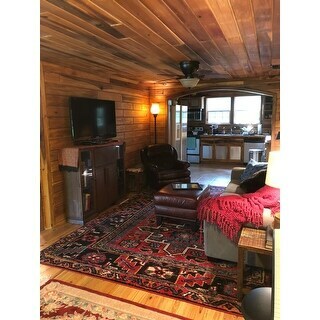 Good price was why we chose it but we are super satisfied. 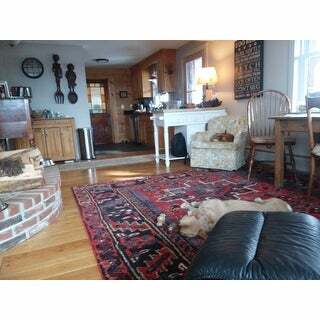 This rug is very nice - it's soft and thick, I really like it. The only reason I'm giving it 4 stars instead of 5 is that the colors look different in person - the colors are brighter/lighter than I expected. 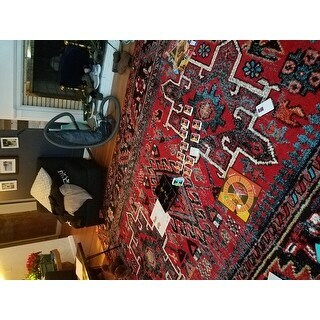 Perhaps it's because the rug that I bought is 9x12 and the ones in the photos are obviously smaller than that - therefore the colors in the design on mine are blown up and don't blend quite like they do on the smaller version. Nevertheless, after a day or two I got used to the colors and I'm very happy with the purchase. This is a beautiful rug. It is soft underfeet. My cats love romping on it. It is colorfuil - not muted. We are thrilled! Thank you. Beautiful rug. Really compliments the dark wood dinning room table. The deep red hides the dog hair and kids’ spills as well. This rug is nothing like the photos. The colors in the picture look much more muted, but in real life they are shockingly bright. The pattern is cool and would be cute in another house, but it will definitely be getting returned. This rug is wonderful. Very soft to walk on even without a rug pad. Great item. The colors are vibrant and the pill is soft. It is a good deal for the price. Very cheaply and badly made. Colors were completely garish, and nothing like the photo on the site. Shipped it back, was charge WAY too much to return it. 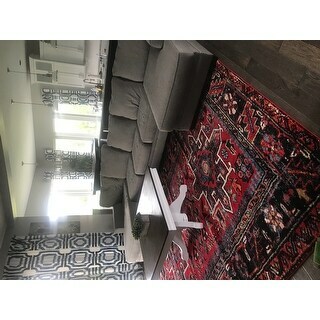 Will not be buying rugs on this site EVER again. Untrustworthy. Color was way off! It is a bright red rug with a lot of orange and turquoise in it. The design is ugly. Image is not even close to actual rug. 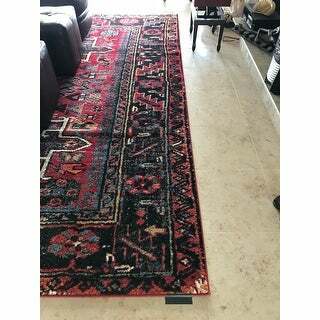 This rug is Absolutely gorgeous wonderful quality very thick the colors are true to the picture I love love love it. "Is this also available in smaller size like 5X7 or 6X8? I'd like to put it in my entry as well as the larger one for the living room." "is there any black in the rug? If not, what are the colors other than red?" In my opinion, this rug features red, black, blue, and orange. 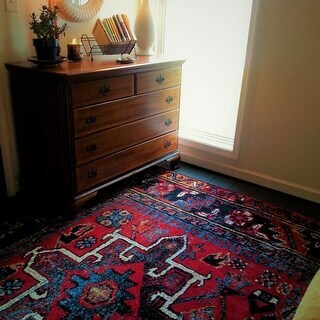 Because it looks like a Turkish kilim.